1 shared with Comoros. 0269 from metropolitan France or overseas départements. Mayotte IPA: [mɑjɔːt] (French pronunciation /maˈjɔt/) is an overseas community of France at the northern end of the Mozambique Channel in the Indian Ocean, between northern Madagascar and northern Mozambique. The territory is geographically part of the Comoro islands, but has been politically separate since the 1970s. The island is also known as Mahoré, especially by advocates of its inclusion in the Union of Comoros. The main island, Grande-Terre (or Mahoré), geologically the oldest of the Comoros, is 39 kilometres (24 mi) long and 22 kilometres (13½ mi) wide, and its highest points are between 500 and 600 meters (1,650–1,975 ft) above sea level. Because of the volcanic rock, the soil is relatively rich in some areas. A coral reef encircling much of the island ensures protection for ships and a habitat for fish. Dzaoudzi was the capital of Comoros until 1977. It is situated on Petite-Terre (or Pamanzi), which at 10 square kilometers (3.9 sq mi) is the largest of several islets adjacent to Mahoré, to which it is linked by a causeway. 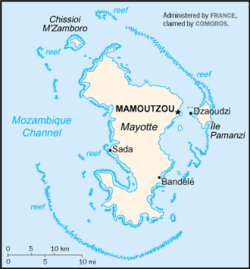 Mayotte is a member of the Indian Ocean Commission, with a separate membership rather than as part of the Comoros. Circa 1500 the Maore or Mawuti (corrupted to Mayotte in French) sultanate was established on the island. In 1503, Mayotte was observed by Portuguese explorers, but not colonized. In 1832, Mayotte it was conquered by Andriantsoly, former king of Iboina on Madagascar; in 1833 conquered by the neighbouring sultanate of Mwali (Mohéli island in French); on 19 November 1835 again conquered by Ndzuwani sultanate (Anjouan sultanate in French; a governor was installed with the unusual islamic style of Qadi, sort of a 'Resident Magistrate' in British terms), but in 1836 regained its independence under a last local Sultan. Mayotte was ceded to France along with the other Comoros in 1843. For the history of Mayotte before 1974 see also History of the Comoros. It was the only island in the archipelago that voted in referenda in 1974 and 1976 to retain its link with France and forego independence (with 63.8% and 99.4% of votes respectively). 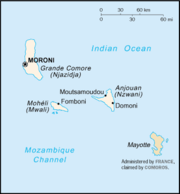 The Comoros continue to claim the island, and a draft 1976 United Nations Security Council resolution supported by 11 of the 15 members of the Council would have recognized Comoros sovereignty over Mayotte, but France vetoed the resolution (the last time, as of 2004, France cast a lone veto in the Council). The United Nations General Assembly has adopted a series of resolutions on the issues, whose tenor can be gauged from their title: "Question of the Comorian Island of Mayotte." The situation of Mayotte proved to be unwieldy for France: while the local population very largely did not want to be independent from France and join the Comoros, some international criticism from post-colonial leftist regimes was heard about Mayotte's ongoing ties to France. Furthermore, the peculiar local administration of Mayotte, largely ruled by customary Muslim law, would be difficult to integrate into the legal structures of France, not to mention the costs of bringing the standards of living to levels close to those of metropolitan France. For these reasons, the laws passed by the national parliament must state specifically that they apply to Mayotte for them to be applicable on Mayotte. The status of Mayotte was changed in 2001 towards one very close to the status of the départements of mainland France, with the particular designation of collectivité départementale, although the island is still claimed by the Comoros. This change was approved by 73% at a referendum on Mayotte. After the constitutional reform of 2003 it became a collectivité d'outre-mer while keeping to be entitled collectivité départementale de Mayotte. Politics of Mayotte takes place in a framework of a parliamentary representative democratic French overseas community, whereby the President of the General Council is the head of government, and of a pluriform multi-party system. Executive power is exercised by the government.